Stay Easy i Addis Ababa, Etiopien: Reservér nu! You will be served with generous portions of breakfast made with the best of ingredients cooked hygienically. At Stay Easy focuses in providing the best of Ethiopian Hospitality. We at The Stay Easy provide superb services both for business travelers and tourists where they feel-at-home away-from-home. Our services are meticulously organized and provided in such a way that they fulfill the tastes and desires of both our foreign and national guests. Stay Easy Hotel is a well-established three-star hotel found at a convenient location in the center of the city. A number of features make us superb and different from others including our services we provide to the best satisfaction of our guests. The business amenities we offer including a 24-hour room service, Complimentary wireless internet access is provided in public areas. Self-parking is complimentary and we also provide a round trip airport shuttle on request. Our rooms are built in such a way to provide enough light and air making our guest to feel comfortable and enjoy a noiseless respite for extended hours or otherwise to do their work at relaxed pace and condition. The 41 rooms that we have made available provide accommodation for affordable prices and are equipped with state-of-the-art furnishings and essential amenities that a modern hotel room fulfills. This is the reason why we are always booked to capacity. The rooms being organized in simple and functional style incorporating ample space provide ambience for our guests to relax as well as to carry out their work in an inaudible environment. Smoking is not allowed in our bedrooms; however, open-air balconies are available on each floor for guests who may wish to smoke without inconveniencing the comfort of other room occupants. All our rooms have built-in fireplaces. Mini bars are also available in deluxe room stocked with free supplies. Complimentary wireless high-speed Internet access is also provided for fast and easy communication. Flat-screen LCD Televisions flexible to view from different angels are available in each room connected with premium satellite channels. Safe-boxes, newspapers, free local calls are complimentary services provided; except that our guests will be required to make international calls through the front office. Our bathrooms are equipped with splendid and spacious shower boxes and provide refreshing hot and cold jet showered water. Additional amenities include complimentary bottled water. In addition, housekeeping is offered daily and additional amenities such as blankets, towels and bed-sheets etc. will be available on request. 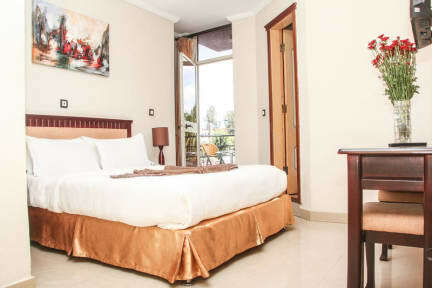 The different types of rooms at the stay Easy are made available in a way to provide our guests comfortable respite after business engagements or site-seeing and enjoy sound sleep during the evening. All the rooms are furnished with basic sleeping, bathing amenities and working desks and chairs and hair drying shaving etc. facilities. We are located in the prime location of Addis Ababa commonly called Hayahulet Mazoria, on Haile Gebreselasie Street. Foreign Embassies, UNECA, Malls, Bustling and colorful Ethiopian markets and other major attractions are located near Stay Easy. 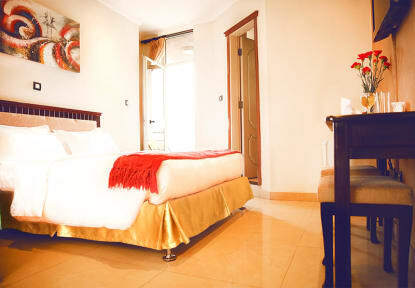 Stay Easy Hotel is a well-established three-star hotel found at a convenient location in the center of the city.